The dough. 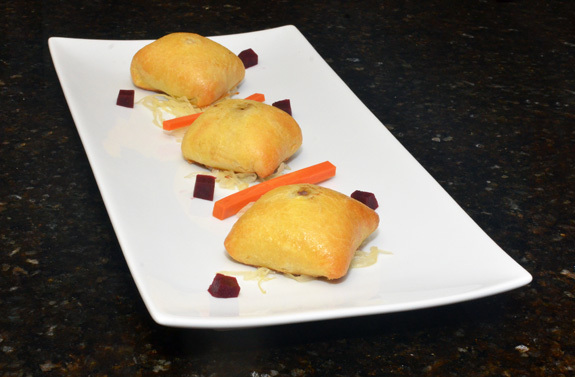 My idea of the perfect baked pirozhki dough is crispy outside but soft inside. Many cookbooks out there either disagree, or voluntarily take unsuccessful shortcuts. The best-working recipe I’ve come up with is a brioche dough using less butter than normal, which takes a few hours to prepare (the instructions are adapted from Michel Roux’s Pastry: Savory and Sweet). 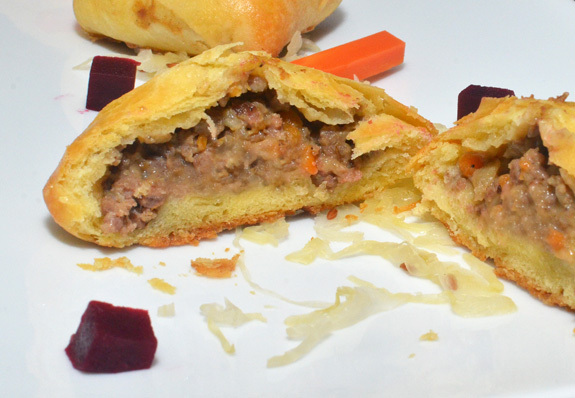 It’s also essential not to overcook the pirozhki. 5 or 10 more minutes in the oven dramatically affect the result. The filling ratio. As much as I like eating brioche, I want the filling to be prominent. 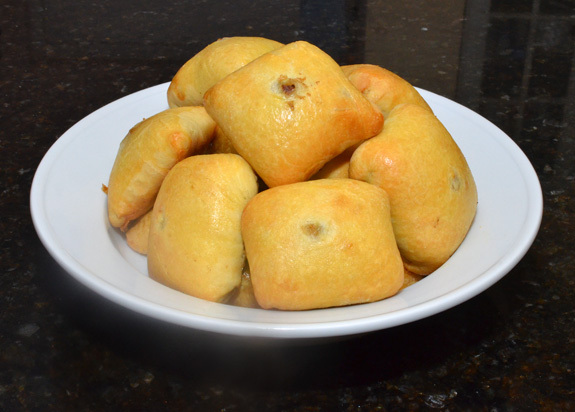 But try to fill your pirozhki too much, and the dough will crack when you bake them. The solution is simple: carve out a little chimney for the steam, just like you would for a pâté en croûte. If you find the hole unattractive, you can always fill it with a small piece of garnish after baking. As for the filling, I’ve opted for a festive blend of wild boar and porcini. I got some nice boar bellies here (warning: these folks mostly sell in bulk), but you can replace them with your favorite stew meat if you prefer — and you don’t need to cook it sous-vide. For the porcini, there’s no need to spend a fortune on fresh mushrooms: since they will be puréed in a blender, frozen mushrooms work just as well, and they’re available here. Rick’s Picks Phat Beets (15 oz, $8), made in Manhattan, have a nice sweetness to them, but this Rick dude should learn to slice beets evenly. I couldn’t cut half-decent-looking dice out of them! Hawthorne Valley Caraway Sauerkraut (15 oz, $6), made in Ghent, NY, is a well-executed sauerkraut that made me like sauerkraut more than I usually do. They have various kinds, including curry and red (made with red cabbage). Beth’s Farm Kitchen Dilly Carrots (8 oz $8) are made in Stuyvesant Falls, NY. They’re not far from Hawthorne Valley above, but they sell their stuff for twice as much money. None of the pickles here are particularly cheap, but these carrots definitely win the Palm d’Or for most grossly overpriced product! The recipe is very traditional and tastes fine, if a little bit strong. They also make jams; I tried their strawberry jam, which wasn’t really worth it either. Place the water and milk in a bowl, stir in the dry yeast, and let rest for 5 minutes. In the bowl of an electric mixer fit with the paddle attachment, add the flour, salt, sugar, and eggs. Pour in the milk and yeast mixture, and mix on low speed for 5 minutes. Scrape down the sides of the bowl, switch to the dough hook, and knead at medium speed for 10 minutes. Add the butter a few pieces at a time while mixing on low speed, then increase the speed to medium and mix another 5 minutes. Cover with plastic wrap, and let rise in a warm place for about 2 hours, until the dough has doubled in volume. Punch the dough, then cover and let rise for another 2 hours. Slice the porcini, season with salt, and sauté in the olive oil in a pan over medium heat for a couple minutes. Add the heavy cream and hard cider, bring to a boil, and simmer for 5 minutes over low heat. Transfer to a blender, add the butter, and process until smooth. Season the wild boar belly with salt and pepper, then place in a sous-vide pouch with the thyme sprigs. Cook in a 166 F water bath for 12 hours, then let cool. Discard the thyme, reserve the meat juices, and cut the meat into small dice. In a saucepan over medium heat, sauté the carrot, sunchoke, and onion in the canola oil until golden brown. Add the cut meat, meat juices, and stock, cover, then cook over very low heat for at least 1 hour, until very tender. Remove the lid, add the porcini purée, and reduce over medium heat, stirring regularly. Mix in the garam masala, remove from the heat, and let cool. Roll the brioche dough on a floured surface until 1/8″ thick, forming a rectangle approximately 16″ x 24″. Cut into 24 4″ squares. If necessary, you can gather the trimmings, roll them again, and cut more squares. Brush the squares with the egg wash, and place about 2 tbsp of wild boar filling in the center of each one. Fold the 4 corners of each square in towards the center so that they slightly overlap, then press gently, flip the pirozhki over, and place on a baking sheet lined with parchment paper. Brush with egg wash, and use the tip of a knife to poke a small chimney hole at the center of each square. Bake in a 425 F oven for about 15 minutes, until the pirozhi turn a golden color; do not over bake. Let cool for a few minutes before serving.